I like it when friends write good, interesting, even important books. It removes any awkwardness from your next meeting when they ask you what you thought and you can honestly say it was great. 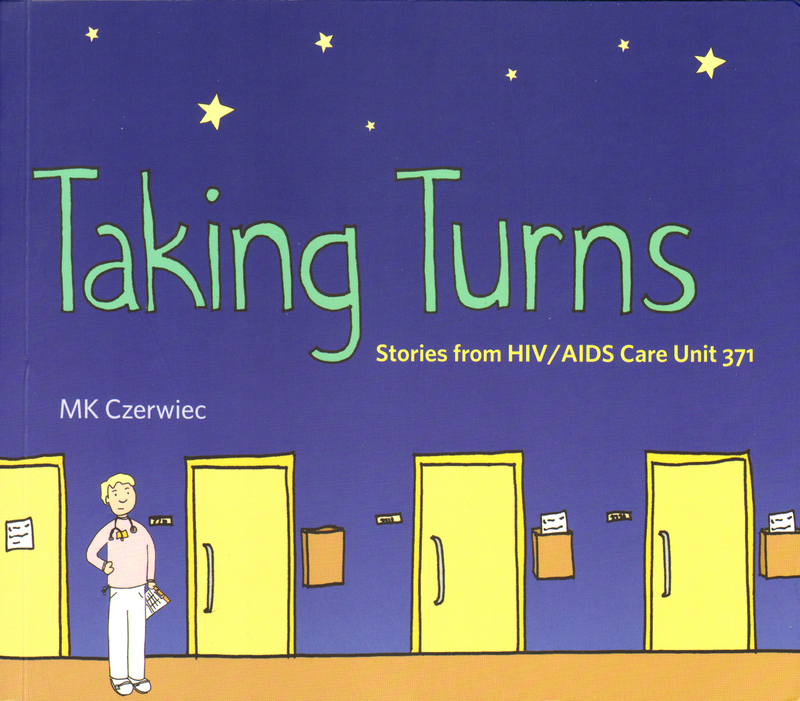 Taking Turns: Stories from HIV/AIDS Care Unit 371 is by my friend MK Czerwiec, who as "Comic Nurse" is a ringleader of the Graphic Medicine community. It's the story of her experience as a nurse on a pioneering hospital unit through the 1990s, from the early days of a mysterious deadly disease to the day AIDS treatment became so effective that Unit 371 closed and MK was the last one left to turn off the lights. Done as a graphic novel, Taking Turns is part memoir, part oral history, and mostly journalism. It's deeply personal. MK writes about her struggles as a young nurse learning the job and finding her place, the panic of an accidental needle-stick, and the challenge of maintaining professional distance--or even knowing if she should maintain professional distance. Doctors, nurses and volunteers broke some rules getting close to patients who were mostly going to die, and while none of them seem to regret it, it took its toll. 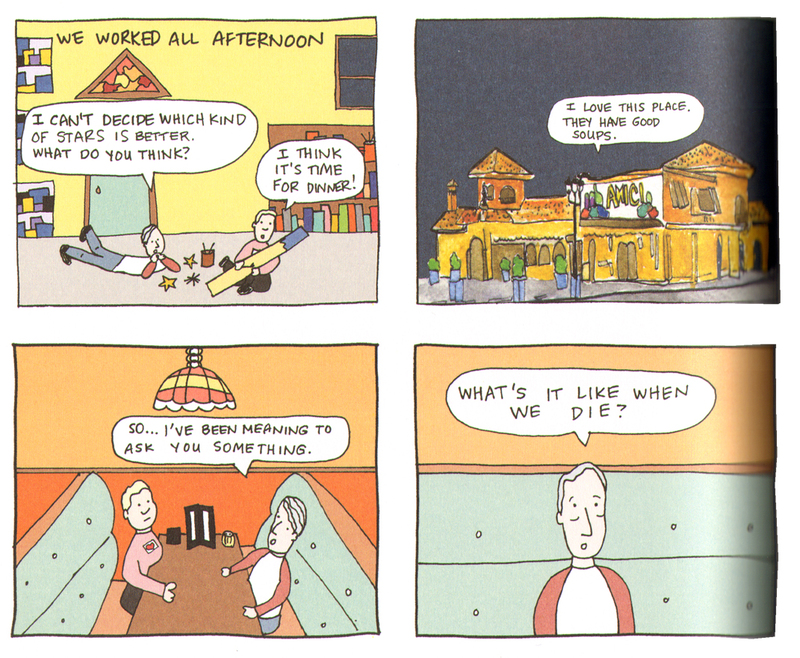 A two-page sequence with MK (in the pink shirt) and Tim, a patient and artist whom MK got to know away from Unit 371. 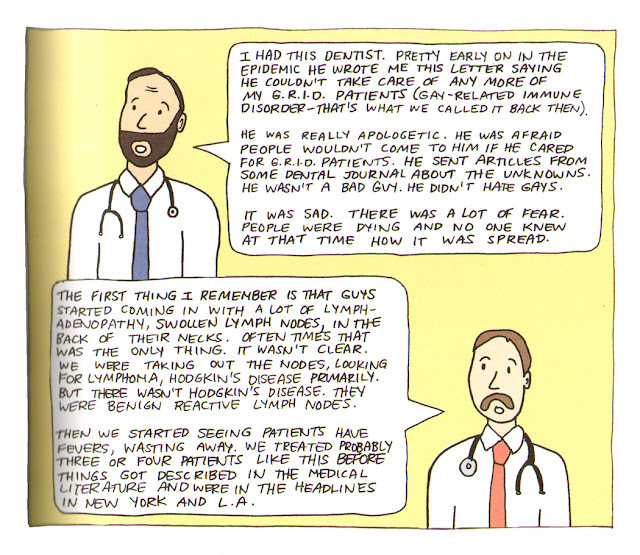 Tim's experience is a major arc through the book, and must represent the fate of dozens of patients MK cared for. The first panel also touches on the motif of stars, to which MK returns throughout the book. Pay no mind to the dark bands on these pages. I scanned them myself and didn't want to break the book's spine to lay it flat on the scanner, so they curved a bit. 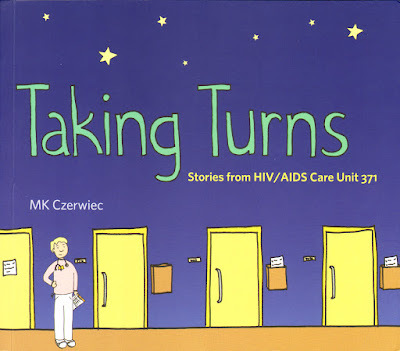 I know from talking to MK while she worked on her book that Taking Turns is primarily intended as an oral history of Unit 371 and the AIDS crisis, captured while memories are still fresh but with the perspective of time. MK needed to record these stories before they faded away. At that, she succeeds tremendously. MK credits fellow Chicagoan Studs Turkel as one of her influences, and I see that. What strikes me as unusual and ambitious, though, is that MK isn't writing about individual people or even an entire generation, as Turkel might have. Although the story is set in a particular time and place, they aren't her true subjects. There's not much that specifically pins her story to the 1990s, and little that requires it to be in this hospital in this city rather than Miami or Baltimore or San Francisco. Her story, and the stories of all the people she interviewed for Taking Turns, focus on what it felt like to do this job. They were eyewitnesses to history. In that respect, I see Taking Turns foremost as first-person journalism. 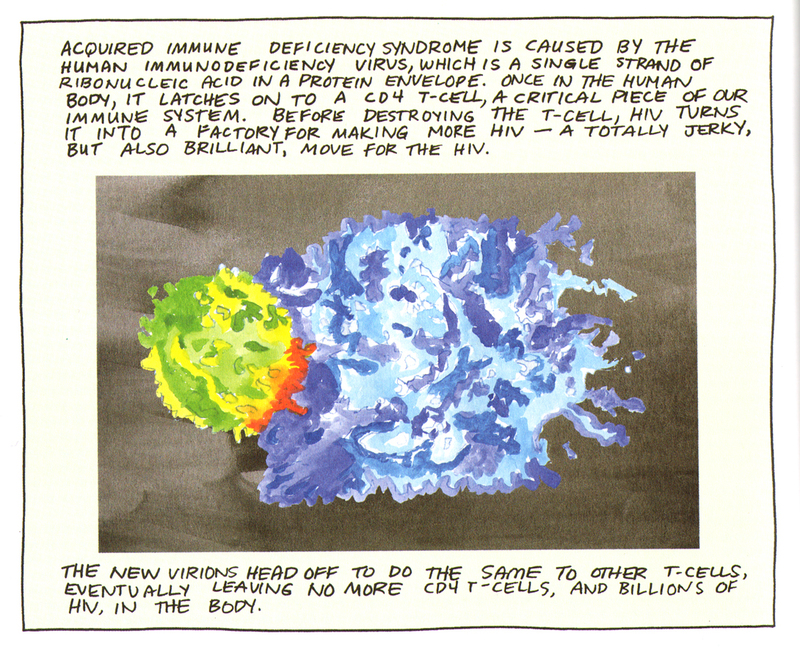 A watercolor by MK illustrating how HIV destroys the immune system. Parts of MK's interviews with the two physicians who started Unit 371. Text-heavy pages like this are interspersed throughout the book, separated by other multi-panel pages that often have little or no text. MK's not afraid of white space and silence. Taking Turns is dense in parts but doesn't feel heavy as a whole. Again, ignore the dark stripe on the left caused by my scan. Let's talk about the art. The excerpts above are representative; that's how it looks. For some comics readers, MK's style would be a barrier. I like it. Her drawings provide all the information needed and tell her story clearly. I know that she put great thought into her color palette and the deliberate decision to use flat tones rather than all the gradients and flashy flair that are only a Photoshop click away. It's a "just the facts" approach to comics and, again, journalism that suits the topic. MK is a documentarian whose camera is locked on its tripod and pointed directly at its subject. I respect her choice. It works for me. 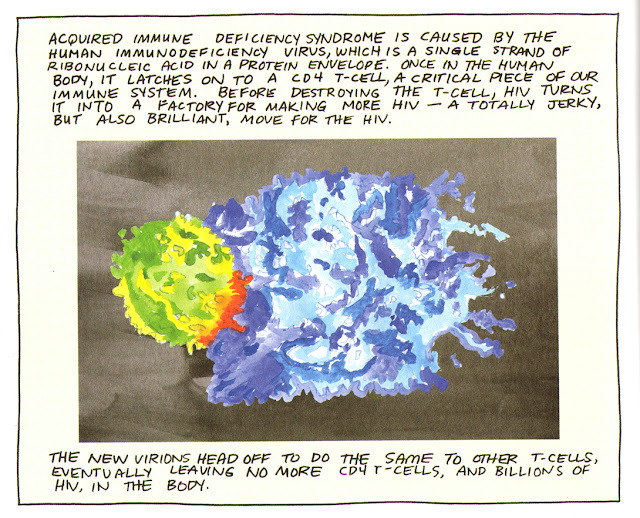 A close childhood friend of mine died of AIDS in his early thirties. I don't claim any special insight from that, except that I was there and aware during the time MK wrote about. I think she gets it right, providing the unique perspective of someone working on the side we don't often hear about. Her observations have the types of detail and truth that only an eyewitness would know. I'd like to think and hope that my friend Jim had a nurse like MK looking after him. What I appreciate about Taking Turns is that MK helps me understand what it was like to care for hundreds of Jims during a time of tragedy and hope that shouldn't be forgotten. 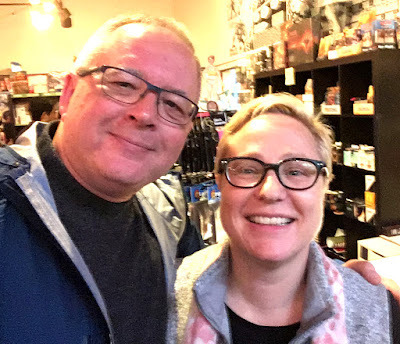 Taking Turns is published by Pennsylvania State University Press as part of a Graphic Medicine series that's on its way to becoming an impressive library. Other recent titles in the series include My Degeneration by Peter Dunlap-Shohl and The Bad Doctor by Ian Williams. Penn State is building a special and unique body of work that's worth supporting. Keep an eye on it. A truly terrible selfie I took with MK in Seattle two weeks ago. Apologies.